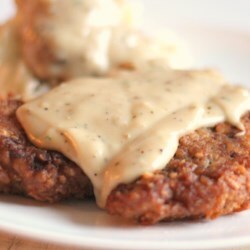 This is the best recipe I've found for chicken fried steak! I allow my steaks to "rest" on a wire rack after the final coating of flour - which seems to help the coating adhere - also make sure to pat your steaks dry with paper towels then season them as you'd like before beginning the breading process - this will also help the coating adhere better. It is also important that the oil reach the proper temperature before adding the steaks - I used Mazola Canola oil instead of shortening and did not need near the amount called for - used maybe 3/4 - 1c total. After the steaks are cooked and keeping warm (to prevent sogginess keep them on a wire rack over a cookie sheet) in a 200 oven; I do add some finely chopped onion and garlic to the oil and drippings in the pan and saute before adding the flour and milk - make sure the flour is cooked in the oil to avoid a pasty, flour-y taste to your gravy. I also like to add about 1/4c chicken stock after adding the milk - I found I only needed about 2 1/2 to 3c of milk. These additions seem to give the gravy the boost my family likes. An EXCELLENT recipe that my family loves, thanks so much for sharing!